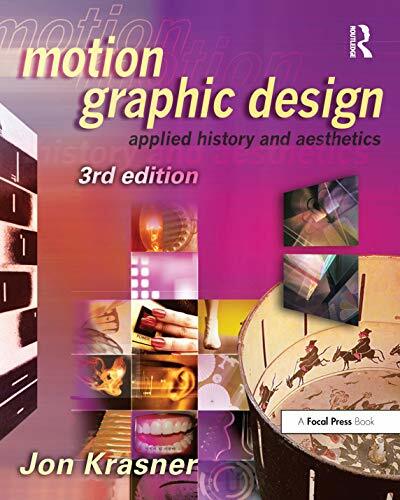 Motion Graphic Design, Third Edition provides a historical and critical overview of how the language of traditional graphic design is combined with the dynamic visual language of cinema in film, television, and interactive media. It features works from highly acclaimed animators and motion graphics studios from across the globe. This is a must-have whether you are a student who is learning the principles of motion graphics or a professional in need of inspiration and new ways to impress your clients. Anyone working in or aspiring to work in the motion media industry will benefit greatly from this valuable resource. "An excellent book/DVD to enhance any motion design curriculum. A must-have for all visual learners; an engaging fusion of inspiration and information." Jon Krasner is a Professor of Graphic Design at Fitchburg State University. Holding an M.F.A. in painting from Pratt Institute and an M.F.A. in graphic design from Boston University, he has been able to synthesize the disciplines of painting, print, animation, and music composition. Professor Krasner brings a unique perspective to the classroom that emphasizes experimentation, aesthetic sensitivity, and critical reasoning. As a practicing artist and professional graphic designer, his multi-disciplinary work has been exhibited nationwide.